Before 1799: he was most likely born and trained in Kamigata. His first stage name is Kirishima Giemon I. There is no evidence of any relationship to the actor Kirishima Gizaemon I. 2nd lunar month of 1799: Giemon plays at the Nakamuraza the role of the rônin Saitô Gorobei in the drama "Ômiura Date no Nebiki". 6th lunar month of 1802: the drama "Natsu Matsuri Naniwa Kagami" is produced for the first time at the Kawarasakiza; Giemon plays the role of Mikawaya Giheiji [casting]. 9th lunar month of 1810: Chikamatsu Monzaemon's drama "Komochi Yamanba" is staged for the first time in Edo, at the Nakamuraza; Giemon plays the role of Ôta Jûrô [casting]. 11th lunar month of 1816: Kirishima Giemon I takes the name of Sôryô Jinroku II at the Kawarasakiza, playing the roles of Sekihara Yoichi and Ôshima Kiyû in the kaomise drama "Kiyomori Eiga no Utena", which also celebrates the shûmei of Ôtani Bajû II, Sakata Hanjûrô, Bandô Matajûrô III, Ichikawa Momotarô I, Tsuuchi Monzaburô III and Ichikawa Kodanji III. 3rd lunar month of 1817: premiere at the Kawarasakiza of Tsuruya Nanboku IV's masterpiece "Sakura Hime Azuma Bunshô"; Jinroku plays the roles of Nagaura and Sanukiya Kinbê [casting]. 6th lunar month of 1830: Jinroku plays at the Ichimuraza the role of Mikawaya Giheiji in the drama "Natsu Matsuri Naniwa Kagami"; the role of Danshichi Kurobê is played by Kataoka Ichizô I. 9th lunar month of 1832: Jinroku plays at the Kawarasakiza the roles of Sagisaka Bannai and Yoichibê in the drama "Kanadehon Chûshingura". 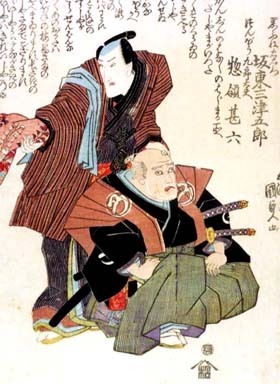 7th lunar month of 1837: Jinroku appears on stage for the last time, at the Ichimuraza, where he plays the role of Ofuji in the drama "Sanshô Dayû Kogane no Toridoshi". 14th day of the 8th lunar month of 1837: Jinroku dies in Edo. Sôryô Jinroku II was a 19th century popular dôkegata and handôgataki actor. From a cultural point of view, it is interesting to note that the expression sôryô no jinroku means "first born, least clever" in Japanese.